Would feel less deceptive and more accurate with a y-axis that isn't a case study in how not to lie with statistics. It's fine for a line graph to have axes that don't start at zero. If it were a bar chart then I would agree with you. 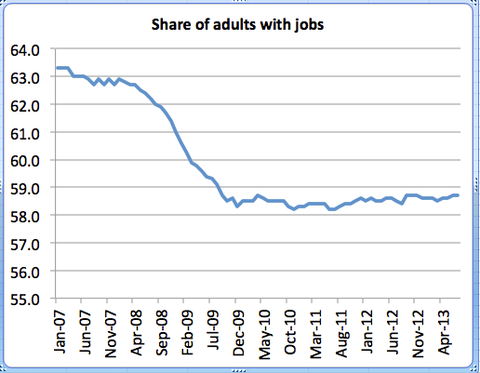 Look, the share of adults with jobs fell almost 5 percentage points and hasn't come back, at all. That is pretty clear from the chart. I'd be interested in seeing this broken out by age group. Are we seeing boomers settling for early retirement and kids locked out due to high unemployment? Chris - Here's the breakdown looking specifically at teens.